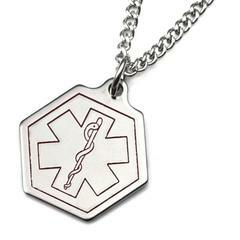 Stainless steel medical id alert necklace cx is great for those who prefer a medical id alert necklace. Our stainless steel CX medical id charm necklace measures about 7/8" from tip tp tip, about the size of a quarter and comes with a 27 inch stainless steel link chain. Medical id necklace CX is small enough for children!